Slit the okra lengthwise. Make sure you don’t cut all the way to the end. If you find ripe seeds inside, you can remove them. Keep aside the Okra. Take a skillet. Add all the spices and flour (chickpea flour, red chilli powder, turmeric powder, dry mango powder, garam masala powder and salt ). Dry roast this mixture on a low flame till you can smell the aroma of the spices. Take out the mixture in a bowl and cool it down. Stuff the okra with the spice mixture and keep the leftover mixture aside. Heat oil in a pan. 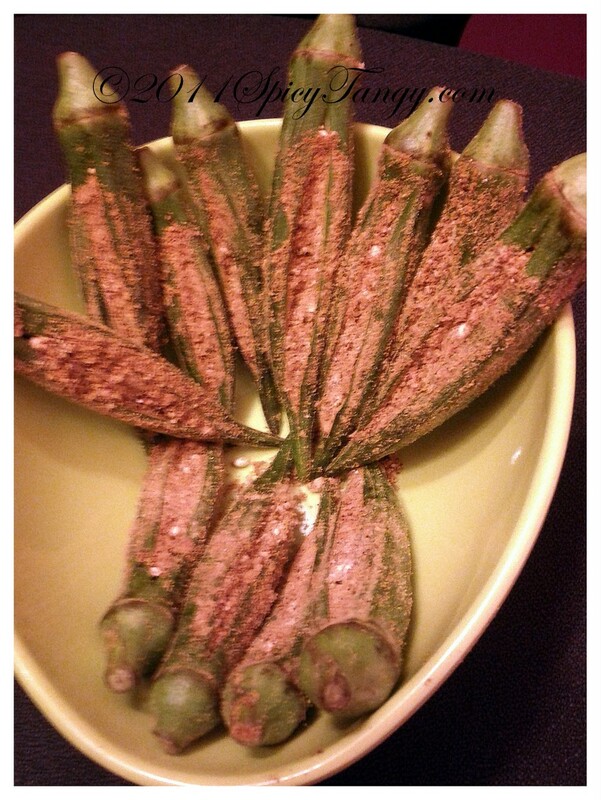 Place the stuffed okra one by one. Cook it on a low flame for 5 minutes. Stir occasionally to make sure it doesn't burn. Now sprinkle the remaining mixture over the okra and cover the skillet with a lid. Continue cooking on low heat till okra are tender. You can adjust the amount of spices to suit your taste.